To preserve and maintain the intergrity of the Occoquan Watershed. Jenna Connor-Harris's gifted Green Club class at Lake Ridge Middle School is getting ready to plant their future pollinator garden with the help of the Friends of the Occoquan who will sponsor their efforts. FOTO members, Sonia Monson and Renate Vanegas introduced their programs and had a discussion on water conservation and the negative impact of litter on our waterways. This was followed up by a garden activity which consisted of planting water melon and zinnia seeds for the students to take home and nourish until they are ready for transplanting. FOTO sponsors an Eagle Scout garden project at Hunters Woods Elementary School in Herndon, VA.
Friends of the Occoquan sponsored an Eagle Scout community garden project at Hunters Woods Elementary School in Herndon, VA. This was added to the school’s already existing garden project. Science Teacher Rachel Negri cooperated with Boy Scout Brad Mitchell of Troop 1983 to complete his Eagle Scout requirements. The project consisted of two raised garden boxes, including all labor and materials, which will help students learn of how to plant, maintain and harvest their own vegetables. FOTO thanks Hunters Woods Elementary School’s Administration, Mrs. Negri and Troop 1983 and Brad Mitchell for allowing FOTO to continue with our water conservation program. 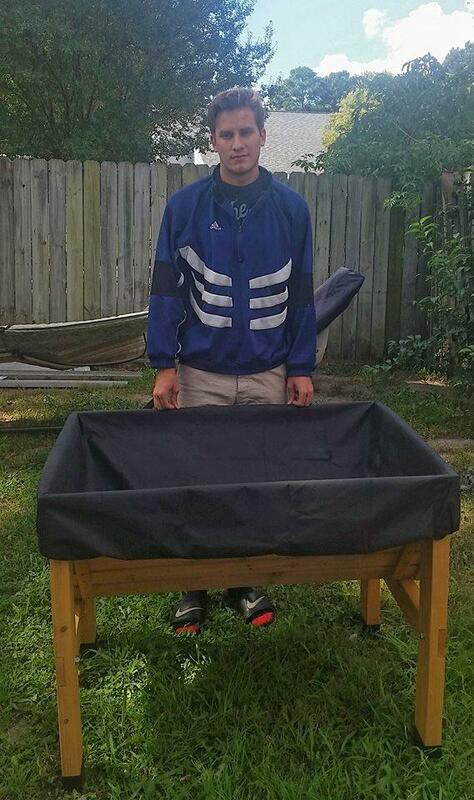 A big thank you to FOTO team member and Eagle Scout Adrian Monson for assembling this wheelchair accessible raised bed for Granby Elementary School's garden in Norfolk, VA.
On July 7, 2017 FOTO met with “Food for Others”, a Fairfax non-profit organization serving a growing number of families. They provide food for 700 families and will be delivering fresh vegetables with the establishment of their new community garden which FOTO helped sponsor. FOTO will cooperate with these types of community gardens as part of our program. To date we support community gardens in Prince William County, Fairfax and the city of Norfolk. 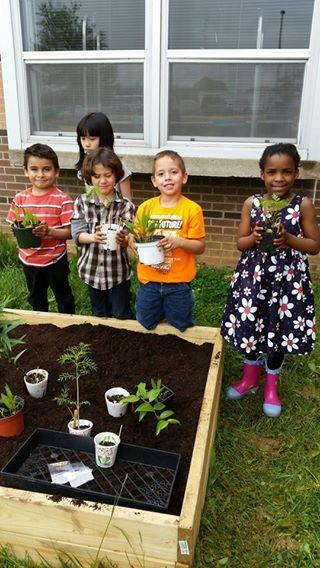 Under the guidance and the help of FOTO providing the garden box, soil, and plants, eager students from Ms. Loriann Pawlik's Penn Elementary class are planting their flowers to attract butterflies. On Monday, April 26th FOTO had the opportunity to do some pole bean planting with the Science/Garden Club at Coles Elementary in Prince William County. FOTO was joined by the Magnificent Three you see pictured below and one of their club leaders, Ramona Richardson. First, FOTO member Sonia Monson gave a brief discussion on what a pole bean is and the best way to plant them. Next, students prepped the soil while the adults stapled netting to the wooden posts to support the pole beans as they grow. Students used a ruler to measure and dig 1 inch holes around the posts. The young ladies got creative and alternated green and purple pole beans around each post. Pole beans and netting were provided by FOTO. Seeds were purchased through Southern Exposure Seed Exchange in order to promote the planting of organic and heirloom seeds. As in the thumbs-up picture below- JOB WELL DONE COLES ELEMENTARY! 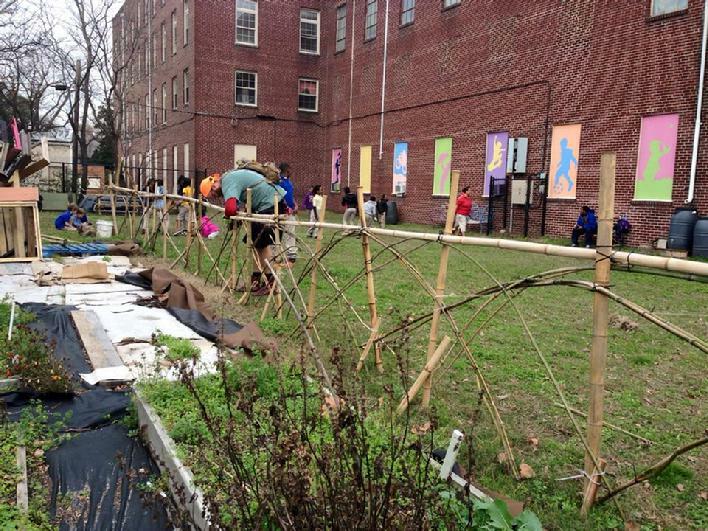 On October 29th, 2015 Wes Cheney conducted a bamboo fencing workshop for Park Place Elementary School in Norfolk, Virginia. In attendence were staff and students from Park Place School and FOTO team member Atsuko Biernot. The school wanted to create a natural border around their community garden. As of December 14th the fence is near completion. FOTO is the sponsor of this fence. Vermiculture is the process of using worms to decompose organic food waste, turning the waste into a nutrient-rich material capable of supplying necessary nutrients to help sustain plant growth. The 2nd-4th grade children learned how to turn kitchen scraps into valuable, organic fertilizer for their school and at home gardens with the help of the friendly earthworm. Photograph credit- Nia Amoruso.